John Stonetsreet and Warren Cole Smith discuss a radical abortion bill introduced in Virginia–on the heels of New York’s insanely cruel abortion law. They also discuss Virginia Gov. Ralph Northam’s ridiculous claim that his comments in response to the bill were taken out of context. His words, as John and Warren note, speak for themselves. 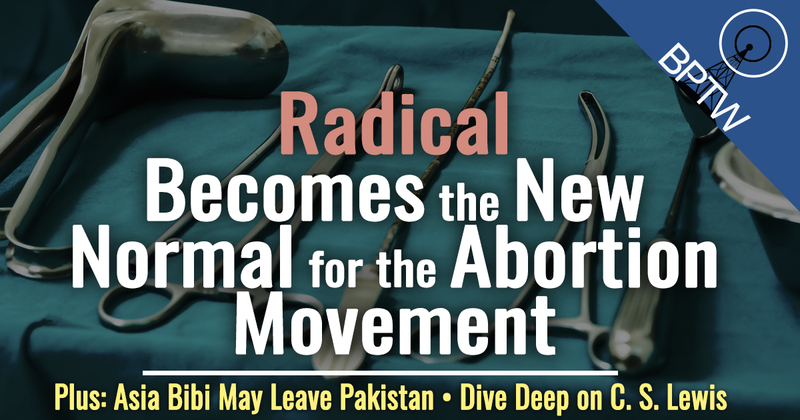 Unlimited access to abortion–even up to and perhaps including infanticide–is what the pro-abortion movement has wanted all along. They also talk about the good news that Pakistan’s supreme court has cleared the way for Asia Bibi, the Christian woman who faced execution for trumped-up blasphemy charges–may now leave the country. In light of that, John and Ed urge the Trump Administration to take in more Christian refugees–brothers and sisters of ours who are in true danger because of their faith. Finally, they discuss the Colson Center’s upcoming Short Course: “C. S. Lewis and the Christian Worldview,” taught by Dr. Louis Markos. Registration is open. And be sure to hear the voice of C. S. Lewis from a rare radio clip we’ve included in our recent BreakPoint commentary. Colson Center Short Course: "C. S. Lewis and the Christian Worldview." Register here!